Satnarayan katha is one of the most prevalent Puja used for worshipping lord Vishnu. It is greatly important for maintaining the fulfillment of all your wishes and it is mentioned in Skanda Puran. It can be conducted on any day but if conducted on Purnima, then it may have better significance in channelizing positivity in your life. It also helps you in overcoming lust, greed, anger, ego or attachments and hence it makes you lead a life, full of constructive and productive forces. Lord Vishnu bestows his blessings and makes your life full of peace and stability. In Shri Satya Narayan Katha, Lord Vishnu form is considered as an embodiment of truth and by worshipping him, abundance can be ensured in one’s life quite blissfully. This Puja has great significant in Hindu scriptures and it is quite popularly conducted after or along with auspicious occasions like marriage or any other success or moving into a new house and so on. This Puja can be conducted on any day and out pundits conduct it for you in the most customized manner as per your convenience, which lets you get all the benefits quite fittingly and accommodatingly. Satyanarayna Katha includes vedic rituals whose proper conduction ensures prosperity and fulfillment in one’s life. If you have any doubt or you wish to take suggestions of our pundits, then for your consultations, we offer free telephonic help services, and you may feel free to call us. 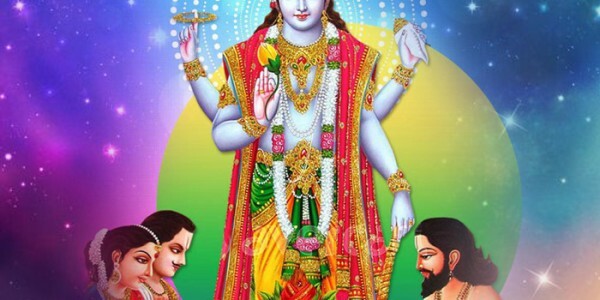 We, at Puja Yagya ensure completion of Puja with utmost accuracy and precision that helps in getting blessings of Lord Vishnu in the most satisfying manner, here, in USA.